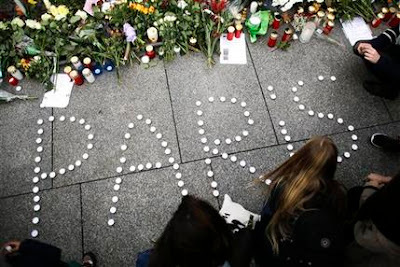 PARIS (AP) -- The Eiffel Tower stood dark in a symbol of mourning Saturday night as France struggled to absorb the deadliest violence on its soil since World War II: coordinated gun-and-suicide bombing attacks across Paris that left at least 129 people dead and 352 injured. He said the attackers in the Bataclan concert hall, where 89 people died, mentioned Syria and Iraq during their rampage. Of the hundreds wounded in the six attacks, 99 were in critical condition. Seven attackers launched gun attacks at Paris cafes, detonated suicide bombs near France's national stadium and killed hostages inside the concert venue during a show by an American rock band - an attack on the heart of the pulsing City of Light. Ahsan Naeem, a 39-year-old filmmaker, said he's been to many of the places that were attacked Friday. "I've seen dozens of gigs at the Bataclan. Eaten at the Petit Cambodge. Sat outside Le Carillon on so many nights," said Naeem, who has lived in Paris for seven years. "All those places will have been full of my people. My friends. My acquaintances." Late Saturday, a crowd of up to 250 people gathered for an impromptu candlelight vigil at the Place de la Republique, the site of a massive demonstration in the wake of the Charlie Hebdo killings earlier this year. Adrien Chambel, a 27-year-old law student, said the crowd was much sparser than in January. "You feel that people are petrified," Chambel said. The president said France would increase its military efforts to crush IS. He said France - which is part of a U.S.-led coalition bombing suspected IS targets in Syria and Iraq and also has troops fighting Islamic militants in Africa - "will be merciless toward the barbarians of Islamic State group." Authorities said seven attackers died, six in suicide bombings, a new terror tactic in France. Authorities said police shot the other assailant, exploding his suicide vest. Police have detained two relatives of the one attacker who has been identified so far, the prosecutor's spokeswoman said. IS also suffered significant reversals this week, with Kurdish forces launching an offensive to retake the strategic Iraqi city of Sinjar and the U.S. military saying it had likely killed Mohammed Emwazi, the British-accented militant known as "Jihadi John" who is seen in grisly IS beheading videos. The Pentagon also said an American airstrike targeted and likely killed Abu Nabil, a top Islamic State leader in Libya. Although Paris was quiet and jittery, Bas said that he intended to go out for a drink - "to show that they won't win." Associated Press writers Raphael Satter, Thomas Adamson, Lori Hinnant, Angela Charlton, Sylvie Corbet, Jerome Pugmire, Philippe Sotto, Samuel Petrequin and John Leicester in Paris; Maamoun Youssef in Cairo, John-Thor Dahlburg in Brussels, Jill Lawless in London and Shawn Pogatchnik in Dublin contributed to this report.